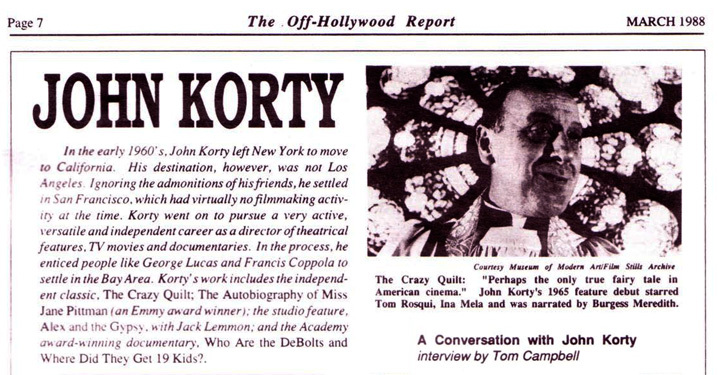 In the winter of 1988 I had the pleasure of doing a phone interview with San Francisco based filmmaker John Korty. I conducted the interview for The Off-Hollywood Report (then known as the Magazine of the Independent Feature Project). I was pleased to see it published in the March issue of that year and am reprinting the last part of the interview below. Korty was a wonderful person to talk with and our conversation went much longer that either of us probably thought it would. I think the magazine agreed to cover any phone charges so we just burned a lot of cassette audio tape. T. Campbell: …Jumping ahead a bit. Twice Upon A Time is an animated film you made for the Ladd Company and George Lucas, You used a technique called Lumage, which is the use of cutouts and a method of animating the cutouts. Tell us something about this animation technique and your experience after completing the film. J. Korty: I developed the Lumage technique over almost 20 years of animating because I couldn‘t stand cell animation and felt there must be a better way. We did Sesame Street spots and I‘d made a short before The Crazy Quilt that was nominated for an Oscar called Breaking the Habit. The making of Twice Upon a Time is a very complex story. It was an independent film to the extent that we raised some money independently to develop it and the money was supposed to go into a screenplay and a sample reel. Originally, it was going to be three or four minutes of animation, As we went along, we felt the sample was more important than a completed screenplay so we changed it to a kind of treatment and a 10 minute reel. lt took one-and-a-half years to do that much. I had known George Lucas for several years and thought “We might as well start here.” and we had a screening with George. He arranged a meeting in L.A. with The Ladd Company. We talked for a while, and within a month or two had a production deal. T. Campbell: At the time there were other animators, like Ralph Bakshi, who were doing very well. Were you unhappy with the quality of animation you were seeing in general? J. Korty: I‘m not really a fan of most animation. I don‘t get excited about the rounded forms or by nostalgia animation. I am more interested in modem graphics. Twice Upon a Time doesn‘t look like anybody else‘s animation. T. Campbell: How much time did you spend on the production? J. Korty: Actually, after one and a half years in the development phase we went into almost three years of production. lt took a long time to get a script that we liked and that they liked. The other problem with our technique was that we had trained quite a few artists, I0 or 12 at least in the development phase, doing Lumage because it was a different technique and you just couldn’t hire people. l didn‘t want to let those people go, so we used them to continue to design characters while we were trying to get the script done. Everything got extended and stretched out. The other problem was that in the three years since we went to Ladd, it had gone into a steep decline. By the time Twice Upon a Time was being finished they had lost $150 million The only other picture about to be released besides ours was The Right Stuff , which they thought was their chance to hit it big and make their money back. They took all the capital they had and put it into the promotion of The Right Stuff and we were, in a sense, orphaned. That’s the kind of thing you can never know will happen in advance. Everything has two sides to it. If you make a film like The Crazy Quilt without a distributor, you can really be up the creek if you finish the film and nobody takes it. On the other hand, here we made a deal up front with what we thought was a major distributor. But three years later we found we were in the wrong place. Between these situations, my choice would be to raise the money independently and take the chances. If it‘s a great film, then you‘re in a very good spot because you’re not committed to distribution. If it’s not such at good film you are going to have problems anyway. T. Campbell: You have to trust your instincts as a filmmaker? J. Korty: Yeah. It’s a gamble and I’d much rather gamble anyway and leave the film uncommitted. The same way with the script. I‘ve gone through several development deals with major studios and it literally can take a year to get the business affairs department to go through the contract. I made a deal with Frank Price. When he was at Columbia Pictures, between 9:30 and 9:45 in the morning and I walked out feeling great. But then we got into eight or nine months of contract shuffling before I could start to work. T. Campbell: What do you look at when you decide to choose or start a project? You’re a writer as well as a director/producer, does the script have to be really solid before you will commit? J. Korty: I learned the hard way. Two of the many projects I turned down over the years turned out to be very successful films. One was The Last Picture Show and the other was Jaws. Somehow the script for The Last Picture Show had gotten to me. I read it and thought it was kind of interesting but I felt it was too much like a soap opera between a young boy and an older woman. It didn’t work for me and I turned it down. To his credit, Peter Bogdonavich came along and said, “This is not going to work. But there is something here that can be made better.” One of the things I‘ve leared to do is to read a script not only for what it is, but for what it can be made into. Also, if it can be remade, am I going to have the political power between the producers, the studio, and the money people to make it into the film I want to make? T. Campbell: How did your television film A Christmas Without Snow come into being? J. Korty: That’s probably the most independent project I’ve ever done for television, The Autobiography of Miss Jane Pitman was brought to me by Hollywood producers. They had a script and they had a star. This movie started off years ago as a very different feature film that I was going to call The Family Band and it was a Beckett-like situation about a lot of weird people. The only thing they had in common was trying to play music. It was very far-out and I realized I was never going to get it done as a feature. One Christmas, listening to Handel’s Messiah, the whole thing clicked into another direction. I thought, “Why not take the idea of diverse people overcoming their differences and achieving something by singing The Messiah?” l wrote up a treatment and took it to Mary Ann Brighton at CBS, who is one of the best people in television. She gave us a script deal. I involved two other writers to help me with it and we did the script here in San Francisco. Obviously, we wrote it for San Francisco and wanted to produce it here. In those days the license fee was $1.7 million and I could have done the whole thing except that I couldn’t come up with the completion bond. l would have had to mortgage my house to get a completion bond for that big a picture. So my agency, which was William Morris, said that what I needed was an executive producer who had clout and could put up a completion bond. They put me together with Frank Konigsberg. Frank came into a project that was pretty far along. I had the concept, the idea, the script. It was all ready to go. We did some casting in his office in Los Angeles. We had our own line producer here in San Francisco. We were a completely organized production and did some shooting and editing here. We came in slightly under $1.7 million and so we made a little bit of a profit. We supposedly had a big percentage of the back-end ancillary and, in fact, made a deal with Lorimar Telepictures. When the bottom-line was in. however, the way it worked out was that the people who made the most money from this were the William Morris Agency, They made $250,000 for probably eight hours of one person‘s time. They got the packaging fee partly out of the license fee and partly out of the post-production fee and distribution deal. So they were in first place. Frank Konigsberg was in second place and I was in third. ‘That really woke me up to how, if you‘re going to do independent production, you’ve got to have some kind of legal mind on your side. There has to be some kind of reward for originating things. I left the William Morris Agency after that because l had spent two years of my life on something and wound up making less than they did in one day. T. Campbell: Do you want to say anything about the projects you’re involved with now? J. Korty: To make a living I have to do a mixture of assignments and outside things. At any one point I‘ve got about 20 or 25 projects of my own invention that are in different states of development, usually unpaid development. One of the ones we’ve raised independent script money for is called Holy Curiosities, which comes from an Albert Einstein quote where he said. “Never lose the holy curiosity.” It‘s the story of a 21-year-old genius who‘s trying to figure out the secret to the universe and he has a love affair with a very amazing woman. It‘s a philosophical comedy and we‘re still trying to get the production organized. T. Campbell: Do you run into that often? J. Korty: Yes, it‘s a real fact of life. It’s one of those rules that has some conventional wisdom be-hind it but in fact it’s broken all the time. Even some big Hollywood pictures have been made where the names were certainly not important. T. Campbell: Are there any independent filmmakers or anything you’ve seen lately that excites you? J. Korty: I don‘t get to see nearly as many films as l want to. I did see Bill Forsyth’s film House Keeping and I liked that a great deal. When l see a good independent feature I get very excited by it. It used to be, when I was starting out. I didn‘t even go to American films. I turned to foreign films. What‘s happened over the years is that a lot of people also turned to foreign films. This is why American films have become more sophisticated, they‘ve become more like European films and cinema is an international art. There is a lot of cross-fertilization. So now you can see some very interesting cinema and it can be American, Italian, or whatever. T. Campbell: Although you’re based in San Francisco, do you come to the East Coast very often? J. Korty: Not as much as I‘d like to. I was there in November to publicize a television movie called Eye of the Sparrow that aired in early December. It was very successful, but was not a project that l was as personally involved in as if I had developed it myself. What I like about the two-hour television movie is that there is no waiting around. If I get offered one of these I usually have two or three days to say yes or no. I have five to six weeks of prep, four weeks of shooting, two to three weeks of heavy editing, and five to six weeks of half-time post-production. Within five to six months the whole thing is done. T. Campbell: It sounds like an ideal antidote for those projects you wait years for, those films you wait forever to develop. J. Korty: Unfortunately, that’s the hardest thing for young people to break into because the networks won’t take chances on anybody. There are some lawsuits going on now about a thing called “network acceptability,” which deals with actors, writers and directors. There’s a surplus, in their minds, of experienced people. As much as I like doing television movies, I still prefer making features for theatrical release and I’ll always continue developing projects in that area. T. Campbell: Good luck. And thanks for talking with me. This entry was posted in The Filmmaker's Perspective and tagged Francis Coppola, George Lucas, John Korty, Miss Jane Pittman, San Francisco Film, The Crazy Quilt by Thomas W. Campbell. Bookmark the permalink.